As Malta continues to serve as a backdrop for many high profile international films, Maltese filmmakers are reaching out and promoting local stories through film. 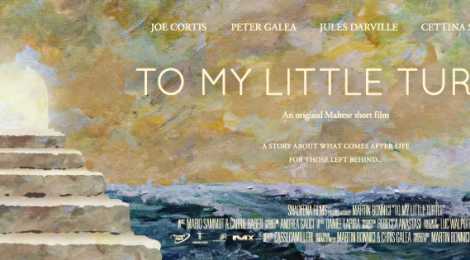 In fact, a short Maltese language film called ‘Sħab’ (To My Little Turtle), by the award winning production company Shadeena Films, will shortly be shown at this year’s Cannes Short Film Corner (CSFC). The production, which is 15 minutes long, is only the second project funded by the Malta Film Fund to make it into this highly-competitive market, and the only Maltese entry to make it into this year’s CSFC. ‘Sħab’ is a Maltese/Swiss co- produced story about what happens to those who have been left behind after a death. The film introduces us to an old farmer, Joe, (played by Joe Cortis) who is mourning the passing of his wife (Cettina Scicluna) while still trying to fulfil her life-long wish of rising above the clouds and looking down on the surrounding white. He does this, on their anniversary, as his own struggles and thoughts of regret push him to take a leap of faith. Local actors Peter Galea and Jules Darville complete the film’s small cast. This project was developed by Martin Bonniċi and Chris Galea at the 2011 edition of the European Short Pitch, a short-film development and co-production workshop run by Nisi-Masa – a non-profit organisation promoting young professionals in the European filmmaking industry. To-date, this remains the only Maltese project to be accepted to this annual event. For more information please visit www.shadeena.com.